Orthodontic Supplies Market size was valued over USD 3.8 billion in 2017 and is expected to witness more than 9% CAGR from 2018 to 2024. Increasing number of people with malocclusion cases across the world will have crucial impact on boosting the orthodontic supplies market in the forthcoming years. Malocclusion or misaligned teeth affects around 60% to 75% of the global population. Malocclusion showed third highest prevalence in oral pathologies globally, just behind dental carries and periodontal diseases. This increasing prevalence of malocclusion cases across the world will increase the demand for orthodontic treatment thus, propelling the business growth. Asia Pacific region is witnessing significant increase in number of population with untreated orthodontic problems. The prevalence of malocclusion cases in Asia Pacific region is more than 50% of the total population. The majority of the affected population in the region remains untreated due to several socio-economic factors such as cost of treatment and awareness regarding appearance. Increasing awareness among people with respect to malocclusion treatment will also be responsible for boosting the market growth in upcoming years. High cost of the braces and orthodontic treatment will be one of the major growth impeding factors. The high cost makes receiving orthodontic care even more scarcer due to absence of reimbursement scenario and healthcare insurance coverage in most of the countries. Removable braces dominated the orthodontic supplies market with over USD 2.2 billion in 2017. The removable braces are preferred more and adopted at larger extent as they provide comfort and convenience resulting in stimulating the segment size at a considerable rate. Also, developing reimbursement policies and healthcare insurance with respect to use removable braces will garner more segment revenue in upcoming years. Fixed braces segment is expected to witness 8.9% CAGR from 2018 to 2024. Fixed braces usually take less treatment time as compared to other orthodontic treatments fuelling its adoption rate. The use of fixed braces for the treatment of severe malocclusion cases and chronic orthodontic disorders will escalate the demand, thereby boosting the segment revenue share. Children & teenagers held a market value of USD 3.2 billion in 2017 will witness a substantial growth over the forthcoming years. Increasing number of teeth misalignment cases among the children and teenagers have impacted the orthodontic market growth. Also, different initiatives taken by healthcare organizations such as American Association of Orthodontists to improve children’s dentals health will further spur the segment’s market size. Adult patients’ segment is forecast to witness 9.1% growth over the projected years. Increase in number of adults undergoing orthodontic treatment across the world will further stimulate the growth of orthodontic supplies market. According to American Association of Orthodontists, around 1 out of 5 orthodontic patients are adults attributing to high demand for orthodontic treatments thus, boosting the segment revenue share. 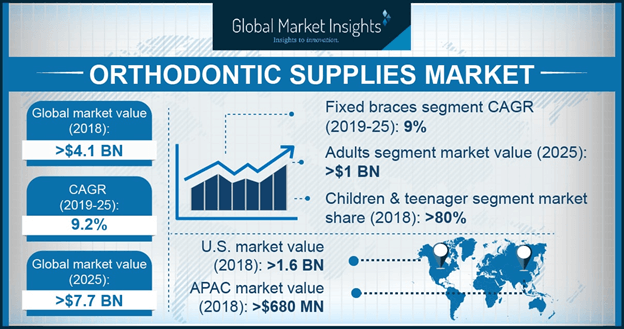 U.S. orthodontic supplies market was valued over USD 1.5 billion in 2017 and is anticipated to dominate the regional share throughout the forecast period. Rise in number of teens and adults that demand for orthodontic treatment will drive the orthodontic supplies market growth. Furthermore, technological advancements and favorable reimbursement scenarios for orthodontic products will positively impact the U.S. orthodontic market size. Japan orthodontic supplies market is projected to witness 10.2% CAGR owing to increase in disposable income of people and increasing awareness towards oral health. In addition to this, rising incidence of dental caries in adults and growing preference for orthodontic treatment will propel the market size. 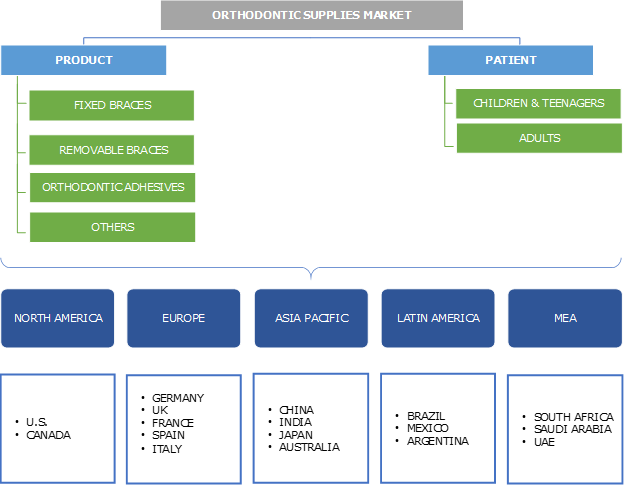 Some of the leading players in orthodontic supplies market include 3M, Align Technology, Straumann group, DENTSPLY Sirona, American Orthodontics, Patterson Companies, Henry Schein, G&H Orthodontics and DENTAURUM. These pharmaceutical companies have implemented strategic decisions to develop novel technologically advanced products. Merger and acquisitions have helped the companies to increase their capabilities and sustain in the market by providing better quality products. Increasing government initiatives regarding improving oral healthcare and rising global need for orthodontic treatment are major factors that have supported the industry growth. Government initiatives have improved the scenario for oral healthcare industry enhancing the growth. Many companies are focusing on development of braces that provide better efficacy and comfort to the user resulting in rising product adoption. Huge investments in research and development to develop technologically advanced products will favour the industry growth.